A little trivia. My first working blog name was "1924 Bungalow." I switched the name to StuccoHouse after my first post. 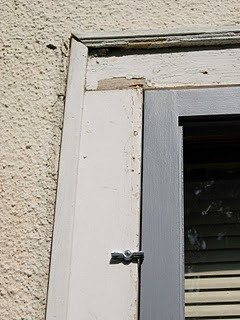 When I started my blog, I had already lived in my house for two years and had just started to get the hang of this thing they call restoration. I had just broken up with a boyfriend and throwing myself into my house restoration seemed more healthy than plotting his untimely demise. I was pretty active on some of the old house website like American Bungalow and Old House Web and had set up an old house website so my family could follow my work. Writing about restoration on a regular basis seemed like it might be kind of fun. I originally didn't even have a digital camera, so I would take photos, develop them, scan them and then upload them. It's a amazing I ever stuck with it. About that same time, both Petch House and Foxcroft were starting their blogs and a little cyber neighborhood was born. One day I received an email from a blog called House In Progress and they were starting a house blog ring and wondered if I would be interested in linking my blog. A number of us had been exchanging ideas about this very topic, so we were very happy when someone actually organized it all. I'm pretty sure that I would not have survived this long in StuccoHouse had it not been for my blog. I had no clue how far beyond my capabilities this house was when I bought it. The blog and you, the readers, have been my therapist, teacher, professional advisor, support system, cheerleading team, and creative outlet. That's an awful lot to ask of one little blog. Amazingly, I can now talk window restoration, paint stripping and sewer replacement with the best of them. Blogger keeps urging me to switch to one of the new blog designs. I can't bring myself to do it. I've signed on to those green and yellow dots so many times over the years they have become synonymous with StuccoHouse in my mind. If you had told me back in 2004 that I'd still be working and writing about this house six years later, I would have laughed at you. Today, I wouldn't bat an eye at a prediction that I'll still be working on my house 10 years from now. Here are nine words that I never thought I would utter in my lifetime. I'm thinking about buying an air compressor. Any advice? I have miles of wood trim to install in the inside of my house. Crown moulding in the kitchen. Base shoe in my dining room, living room, kitchen and upstairs. Wood chair rail and medicine cabinet in my bathroom. And I have a stairs project coming up one of these days that will require finish nailing. It dawned on me one day that spending a few hundred bucks on an air compressor and finish nailer might actually save me money (and time). I have two requirements at this point: 1) it needs to be small and compact enough for me to actually carry around my house; and 2) it needs to be easy to use. I don't want to lose an eye while trying to figure out where the nails go. Keep in mind that up to now I have been using a miter box, hand saw and hammer. Think low(er) tech. I'll also mention I am not looking for the top of the line model. I want something solid that will last but reasonably priced. This post isn't about living in an old house. It's about living in a neighborhood. There's an older gentleman that lives somewhere in southern end of my neighborhood. Over the years I have noticed him out walking. Usually around the bridge between Minneapolis and St. Paul. I've noticed him because he is always walking quite slow, but always with a lot of purpose. Like he has someplace to be. Some days I've noticed he's wearing a big leather jacket on days that are a little too warm for a big leather jacket. I originally thought he might be homeless and living in the park. The other day I was driving to work. I was late, so a took a little different route than I normally take. As I drove down the fairly busy street, I noticed a solitary figure slowly walking down the center of the road. He was holding what looked like and old broom ball stick as a sort of cane. His scarf was dragging behind him in the snow. As I got closer, I realized it was the leather jacket guy. What to do. What to do. This was happening on a pretty busy street and he was headed for an even busier one. I pulled my car over and walked over, thinking I'd be able to convince him to move over to the sidewalk. Everyone would be happy and I'd be on my way. I asked him if I could help him over to the sidewalk. He told me with the snow that he couldn't make it through. He was right. We have monster amounts of snow and you need to be able to climb over piles to walk a city block. I was also trying to decide if he was either drunk or not entirely with it. He seemed sober and we had a short coherent conversation (granted I did most of the talking). So, I told him I was worried a car was going to hit him and asked him if he would move over closer to the side just to make me happy. He nodded and moved over closer to the side of the street. I wasn't sure what else I could do. Surely, I couldn't offer to give a total stranger a ride to places unknown. Right? If you know anything about my luck, you would know that this would mostly likely result in some huge misunderstanding that would end up with me being charged with kidnapping....or I would be victim 28 of the newly identified black leather jacket serial killer. So, I slowly drove off. I saw other cars behind me slow way down to go by the gentleman, who was now over more to the side of the road. Well, you can imagine my dismay when on my way to work this morning, I spotted a lone figure working his way down the center of the street. When I got to work, I went to the Minneapolis city website. I started calling. I was just hoping to find someone that could check this out. Make sure this guy is ok....and if he needs a little help figure out how that could happen. He's on the street at the same time every day (well, so far). I thought it would be easy for some responsible party to just roll by and check things out. I called the Senior Ombudsman. Their suggestion was to call 911 if I saw it again. I called the Minneapolis 311 number and a very nice operator suggested I call the Hennepin County Adult Protection. I called Hennepin County Adult Protection and they told me that if I didn't know his name or address, my only option was to wait for it to happen again and call 911. My experience with Minneapolis' finest has not been good. The thought of them man-handling this senior gentleman makes me reluctant. At this point, I realized it was easier to locate someone to report an animal in possible trouble to in Minneapolis than a person. I don't want to be a busy body. If I were him, I'd be ticked as hell if someone tried to tell me what to do...or worse yet interfered. But, the other side of me couldn't take it if I saw a news story about a man hit while walking down the street right before Christmas. Do I get up tomorrow morning and innocently drive down in that direction to get my latte? If I see him, do I call 911? Am I inserting myself someplace where I don't belong? I know you are probably getting sick of looking up at these water spots. I am too. There hasn't been any changes in the ceiling water spots. They aren't bigger, but they haven't gone away either. So, I hauled a chair over there to see if they were soggy or even damp. Nope, they feel dry. I think we (that's a royal "we" that includes you because it helps me to think I am not in this alone) are only dealing with a water stain at this point. The second photo is a heat vent (closed off in the basement) that runs in a nearby closet and up through the attic space below the leak. The water spots in the ceiling are about two feet outside of this closet. You can see a gap at the top of the duct that runs into the attic space...and presumably lets at least a little hot air up there. The plan today is to put some expanding foam into that gap and seal it up. The last thing I need is a flow of hot air the the spot underneath all the snow and ice. Hopefully, I can find a can of foam in my basement that isn't all clogged up after one use. As much trouble as it has caused me this week, I will admit the snow has made things look a lot more Christmas-y compare to a couple of weeks ago. Here's what I like about having a house blog. My readers have a whole lot more confidence in my abilities than I have myself. Today I woke with a mission. I pulled on my jacket, my mittens and my boots. I hauled my shovel upstairs. I took out those new wood storm windows and I shoveled snow off of my roof from the second floor windows. I cleared the area where the water was seeping into my house. The last photo below shows the suspicious spot in the little metal gully where the shingles meet the membrane...directly above the water stains on my living room ceiling. The sun was out today. When I came home later in the day, the ceiling water spots were the same size as they were yesterday. It may be just be my imagination, but they look like they might be a little lighter in color too. Tomorrow, the plan is to haul the roof rake up there and try to remove even more snow. We are talking a LOT of snow. I was even surprised to see about 2 feet of snow layered up there. Now if you will excuse me...it's 7:30 pm and I am heading to bed. Weary. Fingers crossed. Here is where things stand today. The good news is that I didn't come home to my living room plaster ceiling laying in soggy chunks on the floor. The bad news is my plan of active denial does not seem to be working. I do have a roof rake. Of course, I'd have to retrieve it from my garage currently buried in snow....and dig a path in my back yard to get to the garage. Or I suppose I could drive back there. The roof rake is not an ideal solution for a few reasons: 1) I will need to get on a ladder to use it; 2) the roof on that section is curved, so I'm not sure it will do much; and 3) the roof in that spot is membrane and I'm worried it could tear if the rook rake goes rogue on me. The only other option is to try to use the rake from the dormer windows. Probably a safer route and possibly an easier way to reach that spot. That said, I'm not sure I could get the angle (and strength) I'd need to actually get the snow to fall off of the side of the roof. Wonder how much it would cost to just pay someone to do it. There I was relaxing on my couch after a long day when out of the corner of my eye I spotted something on the living room ceiling. At first I thought it was a shadow. I got up and walked over to check. Water. Two water spots on my plaster ceiling. It must be leaking at the valley where my front door overhang meets the rest of the roof. I have 20" of snow on my roof. 4" more on it's way tonight. The area above those spots is inaccessible attic. There is no way on God's green earth I am going to be able to get up there and clear things off until this weekend. I'm falling behind in my posting. At any rate, the replacement back band is in. This has been a very long saga. 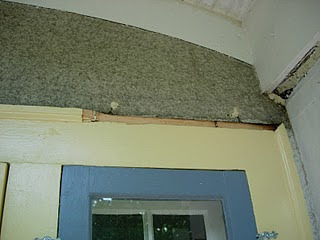 The back band surrounding my dormer windows was also totally replaced. It took the brunt of 80+ years of MN weather. This is one of those projects that I'm going to totally forget about. When you walk up to the house it looks like it should. You would never notice the difference (unless you were forced to read about it for the last few years). I hired this job out. I didn't have the time or the correct tools. If you are a perfectionist and have done enough work on your house, there definitely comes a point where it is hard to let a stranger mess with things (with the notable exception of the guy that worked on my much beloved kitchen cabinet). They rarely do things up to your exacting standards. The miter corners on this job are going to be that issue for me. They are okay. 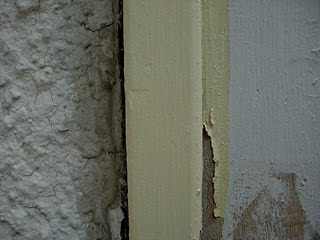 They have too much caulking in them for my liking; they are not as tightly fit as I would have done myself. There. I said it. Now, I have to let it go. And, I must admit that the little copper drip edge is much better than I ever could have done. Yin and yang.